The first true non invasive thermometer and the world first smallest clinical infrared thermometer. fractions of a second the temperature reading will show on the LCD display. 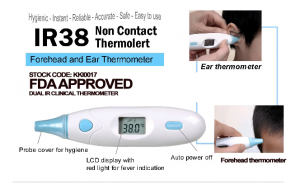 Some forehead thermometers in the market either needs " a touched " scanning across the forehead ( hygienic problem ) or a minimum distace ( a few centimeter / one over inch ) to read correctly but the later exposes more to ambient temperature variations, hence affect the actual reading. 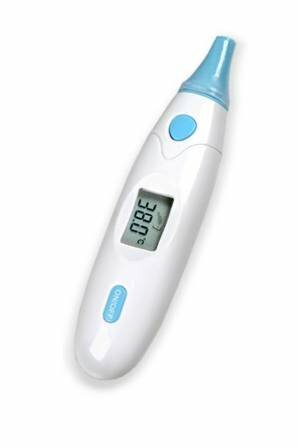 For extreme temperature differences such as cold winter or hot summer out-door, you can use as alternative ear thermometer as a back up by activating the ear thermometer mode located at the front end of the thermolert. The thermolert will alert you with along beep and color changing LCD ( from green to yellow ) if temperature exceeds 38 degree Celsius ( feverish condition ) therefore suitable to use at night. Due to the nature of the non invasive measurement, Thermolert is therefore suitable for us both in hospital environment or at home. It is a " Revolutionary Thermometer "